Although wide enough for two-way traffic, Braeland Avenue between Herrick Road and Langley Road is a one way local street [speed limit? volume?] connecting Langley and the Newton Centre Village to Parker Street, and providing one-way vehicle traffic to complement Union Street. It also provides pedestrian access to the inbound platform of the MBTA green line, serving as the main access point for the entire residential neighborhood south of the station. Braeland Avenue abuts the MBTA property on one side and has residential properties on the other. There is a sidewalk on the residential side but no functional sidewalk on the MBTA side. Along the MBTA side between Herrick and Langley, parking is mostly unmetered with a 4-6pm restriction, and is heavily used by commuters and therefore unavailable to residents and short-term business parking. The one lane of traffic is far wider than necessary [width?] and there is no visual screening of the MBTA property for area residents. Trees on the MBTA property are cut down as part of routine maintenance. Sidewalk and tree berm: The creation of a sidewalk along the MBTA (north) side between Langley and Herrick, with room for tree plantings, could give the street a more residential feel with a visual screen for abutters and proper pedestrian access for MBTA commuters. An ADA-compliant concrete sidewalk with granite berm would replace the current asphalt berm and narrow the street by at least 5 feet. Pedestrian safety improvements: A small neckdown at the northeast corner of Braeland and Herrick would create a shorter, safer crossing for pedestrians without encroaching on the single lane of traffic. This pedestrian crossing serves MBTA passengers using both inbound and outbound platforms going to the 52 bus or points south in the neighborhood, including Andover Newton/Hebrew College. A narrower intersection would also help discourage wrong-way traffic. Another neckdown in front of the station entrance could ensure clearance for pedestrians. Contraflow bicycle lane: By creating a contraflow bicycle lane, the existing single lane of traffic could be narrowed down even further, calming traffic. A contraflow lane could provide a low-stress route to connect Cypress and Parker Streets to Langley to the dedicated Union/Beacon Street bicycle lanes for bicycle commuting towards Boston, and bypass hazardous bicycling routes on Union and Beacon Street in the village center. Question: could the line of sight for bicycles exiting at Langley make a contraflow lane impossible? Sharrows would mark the oncoming path in Braeland's single lane of traffic, with sharrows marked in both directions on Braeland between Cypress and Herrick, where speeds should already be very low. Bicycle shelter: High-capacity, sheltered bicycle parking could also be provided along the berm, similar to facilities at Eliot Station. This, along with new bike lanes connecting the southern portion of Newton via Parker Street, could encourage more trips by bicycle + public transit. Parking management: There is also the potential to better manage parking to allow more turnover for residential, guests, and business use. Free long-term parking, likely used by commuters, makes this space unavailable for residents and and businesses during peak hours. Parking solutions such as a permit program, or parking management systems with new technology, not meters, could create opportunities for employee parking while giving abutters improved access to parking. 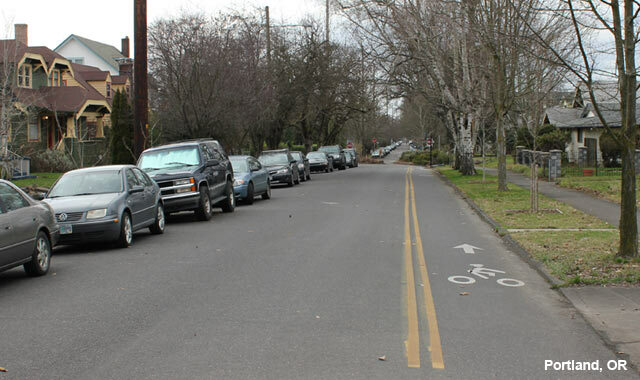 More spaces could possibly be added using angled parking, further reducing the street width and calming traffic, and likely an alternative to a contraflow bicycle lane. Because Braeland abuts an MBTA station entrance, Chapter 90 funds may be available with potential for cooperation of the MBTA for landscaping, bicycle storage. Braeland pavement condition index is 74. The TIP shows it is planned for repaving in FY2018. Note that the dimensions on attached sketches are estimates and are given in metric.